Some authors seem to write in such a way that many of their books are best read together. For me, Brian McLaren is one of those authors. A good example would be his popular books The Secret Message of Jesus (SMOJ) and Everything Must Change (EMC). I read SMOJ before EMC was released and found myself asking, “so what?” – its a pretty good book, but seems to stop short of what we should do with this kingdom perspective of the gospel. On the other hand, a friend of mine read EMC without reading SMOJ and felt that it was too political without much theological teeth. Read together, you may still disagree, but at least you have his whole case laid out. Over the next few days I’d like to post a review of two more McLaren books that I think are best read in tandem: A New Kind of Christianity: Ten Questions That are Transforming the Faith (not to be confused with the similarly titled New Kind of CHRISTIAN) and Naked Spirituality: Life With God in 12 Simple Words. I confess that my reviews pretty much ignore his major project in both books – not that they aren’t valuable or worth considering, but I found his subplot to be much more intriguing. Also, my review doesn’t attempt to go into the hyperbole in McLaren’s work or the limitations of his approach – for one example of a review which touches on these issues regarding New Kind of Christianity, check out David Fitch’s post. One of the common themes that arises in my conversations with Christians and non-Christians alike has to do with how to deal with the seemingly irreconcilable beliefs and positions among Christians. This disparity is only heightened by the antagonism that surfaces within the church when these differences come up (consider the firestorm surrounding Rob Bell’s book Love Wins). Though I am a committed disciple of Jesus, I must admit that at different times I still wrestle with both of these questions. I move from times of certainty into periods of doubt and struggle and then sometimes into seasons of despair…and then back again. My understanding of God, people, the church and faith are far from static. In the midst of this larger project he also describes a progression through seven quests of faith that he labels (with a controlling metaphor of the light spectrum) as survival (red), security (orange), power (yellow), independence (green), individuality (blue), honesty (indigo) and ubuntu (violet). Ubuntu is an African word referring to “one-anotherness, interconnectedness, joined-in-the-common-goodness and profound commitment to the well being of all” (233). He then points to a possible eighth quest of “sacredness” (ultraviolet light perhaps) and more, as yet unseen, quests beyond that (drawn from his conviction that perfection is a never-ending process of becoming). Of course, McLaren has a way of unsettling and often offending more traditionally-minded Christians (and even not-so-traditionally minded ones). Though I don’t always find his conclusions thoroughly convincing, I do find his questions to be quite powerful and thought provoking. As he works through what he believes are natural progressions of faith, he describes what Christianity looks like when it adopts (his description of) Greco-Roman concepts of static perfection rather than the more Jewish concept of perfection as a dynamic process of continually becoming. This understanding is similar to (but less artistic than) CS Lewis’ description in his book The Last Battle, where heaven is depicted as an ever expanding fractal where we are called to continuosly move “further up and further in”. An ubuntu or violet faith will require us to stop seeing the earlier ranges as inferior, wrong or bad. Rather, we must see them as necessary. Each offers something essential to the larger human quest. Each adds an essential band in the full spectrum of light. And contrary to honest indigo thinking, the ideas and beliefs of the other ranges in the spectrum aren’t actually dishonest for the people who hold them: they are simply the way reality honestly looks from that vantage point. From red, the world honestly looks red. From orange it looks orange, and so on. Theologically, we could say that people in a certain zone of a religion or denomination are seeing God in the only way the can see God, and as only they can see God. Yes, it is ultimately a mistake for green, yellow, or blue people to say that God is only green, yellow, or blue, although this is what people at these stages will tend to say. But that is no greater a mistake than for indigo people to attack them for doing so, which is what indigo people will tend to do. 235. I remember thinking as I read this paragraph toward the end of the book that McLaren could (and perhaps should) write a whole new volume specifically devoted to this concept – which, at least in part, he seems to have done in his next book – otherwise, the polarizing nature of the arguments against the “Greco-Roman narrative” will likely serve to destroy much of the positive implications of his writing. We’ll turn our attention to that book and then briefly to the relationship between these two in the following parts of this review. 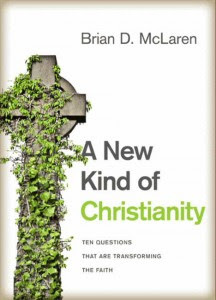 Posted on April 22, 2011, in book reviews, brian mclaren, new kind of christianity. Bookmark the permalink. Leave a comment.